Wow… the month of August is here already and 2016 is as good as over - how times fly. But it’s not over until it is over, so I am not giving up on the year 2016, neither am I giving up on my struggles and the things I am yet to achieve. I woke up this morning with lots of Happy New Month messages from family and friends most on social platforms and I smile. You know what they say about a new beginning and a second chance or a new opportunity, that’s how I feel right now haven read all the messages. I feel God’s grace telling me snap out of the challenges and negatives that happened in the months past and forge ahead into greater day ahead. This is the message for me and I felt I should share it with you; someone could tap into my new month inspiration. 5 months to go... we have survived 7 months already, let’s make the rest of the 5 count. Yes we can, God helping us all. Have a great August… I love you. It is o, How time flies. Gift, you can say that again. To be sincere July was not favorable at all but His grace was sufficient for me. 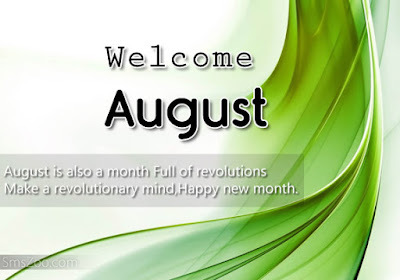 August brought with it from its onset a promising beginning and I'm glad to partake in it. I know and I believe it that this month and the remaining months of the year will give us greater reasons to identify with our creator who made all things. The positive energy which you have approached this month of March is good. Keep it up... I am sure with the right attitude and God's aid we will all have course to smile by the end of the month.